Each year our United Methodist Women’s group has a program entitled “A Call to Prayer and Self-Denial”. During the evening we look at a particular issue that is affecting our world and learn about ways to get involved to make a change for good. This year, the focus was on the global water crisis with an emphasis on the damaging effects bottled water is having on our world. Yes, you heard right, bottled water is quickly breaking down our planet!! 1. Each year there are 3 billion pounds of waste from bottled water!! As most of us know, plastic is not biodegradable. Where does that plastic end up? Much of it finds it’s way into our oceans, streams, rivers and lakes where it breaks down enough for fish and animals to eat it. Slowly and surely, the plastic we discard is making it’s way back up our food chain. That thought gives me pause as I bite into a piece of chicken. 2. Making bottled water wastes water. It takes 3 times the amount of water to produce the bottle as it does to fill it!! Plastic production requires the use of water, as does filtering the water that goes into the bottles. 40% of the water used to make one bottle of water we pull from the gas station is simply poured down the drain. 3. Making bottled water wastes oil. 17 million barrels of oil are used in the production of bottled water each year!! Look at a bottle of water. Imagine seeing 1/4 of that bottle filled with oil. That’s how much oil went into the production of that bottle of water. That’s what we’re drinking. 4. Bottled water is not held to the same FDA test standards as tap water. There are more stringent government regulations on tap water than bottled water. 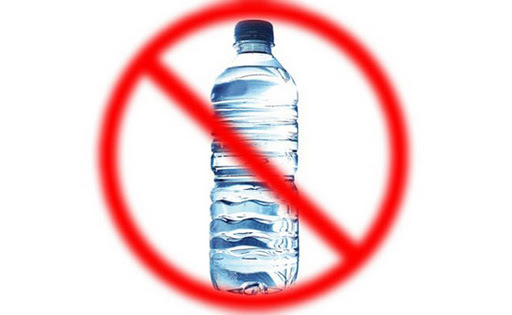 Bottled water companies are not legally required to divulge the source of their water. AND, 40% of all bottled water sold is actually tap water!! 5. Producing bottled water dries up sources of water for communities and farms throughout the country. If we continue to consume water at the rate we are currently consuming, it is only a matter of time before communities in the United States are affected by the global water crisis. Here are some resources if you’d like to check the facts. I am committing to end my use of bottled water. Would you do the same? Yes, I am committed. Yeeesh. This was a great post, friend. Lots of new info I didn't know.So sorry that I have been out of touch lately, but wow! Look at you blogging away. Good job.I'll send you an email soon.